For decades, Emery and Rimoin’s Principles and Practice of Medical Genetics and Genomics has served as the ultimate resource for clinicians integrating genetics into medical practice. With detailed coverage in contributions from over 250 of the world’s most trusted authorities in medical genetics and a series of 11 volumes available for individual sale, the Seventh Edition of this classic reference includes the latest information on seminal topics such as prenatal diagnosis, genome and exome sequencing, public health genetics, genetic counseling, and management and treatment strategies to complete its coverage of this growing field for medical students, residents, physicians, and researchers involved in the care of patients with genetic conditions. This comprehensive yet practical resource emphasizes theory and research fundamentals related to applications of medical genetics across the full spectrum of inherited disorders and applications to medicine more broadly. Clinical Principles and Applications thoroughly addresses general methods and approaches to genetic counseling, genetic diagnostics, treatment pathways, and drug discovery. Additionally, new and updated chapters explore the clinical implementation of genomic technologies, analytics, and therapeutics, with special attention paid to developing technologies, common challenges, patient care, and ethical and legal aspects. 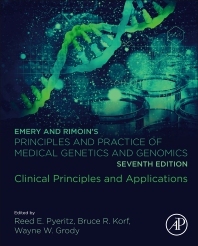 With regular advances in genomic technologies propelling precision medicine into the clinic, the seventh edition of Emery and Rimoin’s Principles and Practice of Medical Genetics and Genomics bridges the gap between high-level molecular genetics and practical application and serves as an invaluable clinical tool for the health professionals and researchers. Bruce R. Korf is the director of the Heflin Center for Human Genetics and chairman of the Department of Genetics at the University of Alabama at Birmingham. In April 2009, he began a two-year term as president of the American College of Medical Genetics (ACMG). Korf received his M.D. from Cornell University Medical College and his Ph.D. in genetics and cell biology from Rockefeller University. He completed a residency in pediatrics, pediatric neurology, and genetics at Children's Hospital, Boston. Prior to his appointment at the University of Alabama, he served as clinical director in the Division of Genetics at Children's Hospital from 1986 to 1999, and as the medical director of the Harvard-Partners Center for Genetics and Genomics from 1999 to 2002. He was associate professor of neurology at Harvard Medical School and directed postdoctoral training in medical and laboratory genetics at hospitals affiliated with Harvard. Korf's principal area of research is neurofibromatosis. Korf is the author of Human Genetics: A Problem-Based Approach, an introductory graduate textbook used by medical students and genetic counselors. He is co-author, with Dorian Pritchard, of Medical Genetics at a Glance, and an editor of Emery and Rimoin's Principles and Practice of Medical Genetics and Genomics.